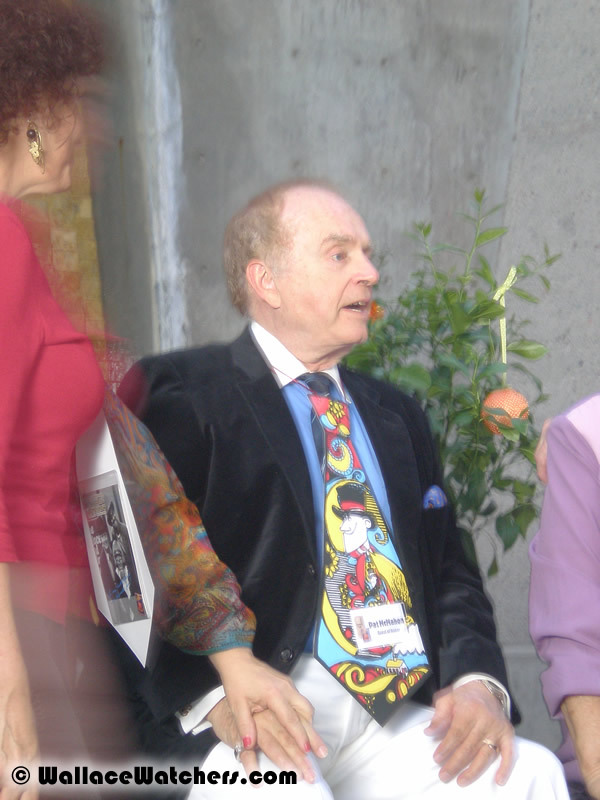 Ladmo Kwiatkowski (’53) is best known for his role in the longest-running children’s television program in the nation. 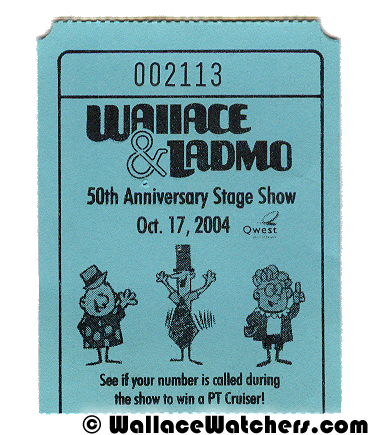 The Wallace and Ladmo Show ran for more than 35 years, and more than 100,000 children visited the studio during more than 9,000 show. 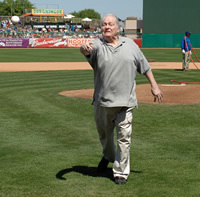 Ladmo attended what was then Arizona State College from 1949-53, where he continually lettered in baseball. Upon graduation, the Cleveland Indians asked him to play baseball for them, but Ladmo had other dreams. He went to work for KPHO-TV in 1954, on the It’s Wallace show, and the rest is history. For his work, Ladmo received seven Emmy awards as well as the Copper Mike Award. His special concern for children led Ladmo to endeavors outside the television studio. Ladmo started Rookie Junior League baseball for children ages six to ten-years-old, and he remained an active part of the program for several years. The Tempe Jaycees gave Ladmo its Service to Humanity Award, while the Phoenix Jaycees named him one of the Outstanding Young Men of Arizona. In addition, Ladmo has received the ASU Alumni Award and the College of Public Programs’ Distinguished Achievement Award. The State of Arizona was stunned when it heard of the death of Ladimir Kwiatkowski on March 2nd, 1994 after a brief illness. The funeral Mass was held at Our Lady of Mount Carmel Church in Tempe, Arizona on March 4, 1994. When I got there, it was at the mortuary. We were all there and I started greeting people. Why, I don’t know. Well, I guess people kept talking to me and I shook hands. I couldn't believe, I mean . . . there were motorcycle guys in leather outfits and beards and helmets giving me hugs. It just made me feel so wonderful. They were absolutely great. They showed their love for this man which made me feel good. In fact, a young man came up to me and said “May I please have a moment of your time?” I said sure and he said ‘Six months ago I had an out of body experience.’ He said ‘My heart had stopped and I went to heaven.’ He says ‘I didn’t want to come back. I was so happy there. I felt so good, but they told me it wasn’t my time. I came back.’ He says ‘Believe me, Ladmo does not want to come back. He’s perfectly happy where he is.’ I thought that was very nice of him to come up and tell me that. It meant a lot to me and I kept thinking of that young man saying well, he’s happy and contented and he’s no longer in any pain and so that helped. A young girl called me, it must have been two months later, and said that her and her brother had gone to the visitation and they met this young man there and they had agreed that if the show ever came back on the air or a special came on the air that they would get together to watch it. She said ‘I can’t remember his last name, but he signed the book right after we did. Would you mind looking it up?’ So I went and got the books and took me a while but I finally found the name and told her the name of the young man. So whether she got a hold of him or not I don’t know. The people . . . I don’t know how to express it, they made me feel so good. And I thought ‘I’m not supposed to feel good. My husband has just died. I’m not supposed to feel this good.” And at the funeral, it was packed. An airplane was flying over with a banner. The [Catholic] bishop [Thomas O’Brien] was there. I guess he doesn’t go to too many funerals. Steven Spielberg sent me a huge plant and wrote me a sweet letter. I had cards from people I didn’t know. I would say two to three thousand cards. It kept me in a state of . . . awe, I guess. And it made me feel good that he was that loved. That people cared that much. Arizona Representative Ed Pastor read the following speech before the United States House of Representatives on Friday, March 18, 1994. Mr. Speaker, I would like to take this opportunity to say goodbye to a personal friend of mine and a hero to thousands of Arizonans known to us simply as Ladmo. Ladimir Kwiatkowski, co-star of the Wallace and Ladmo show died last week and I know that I am speaking on behalf of all Arizonans in saying that he will be greatly missed. Ladmo studied journalism at Arizona State University where he played baseball. After four seasons at ASU, he was offered a contract by the Cleveland Indians. Instead, he chose to finish school and go to work for KPHO-TV where he eventually became the co-star of what came to be the longest-running local television show in the Nation’s history. For 35 years, Ladmo played the mischievous, cheerful character who always got caught doing things the kids wished they could do. His childlike enthusiasm instantly won over the hearts of Arizona’s youth. They trusted him and saw him as a role model, as did their children and their children’s children. 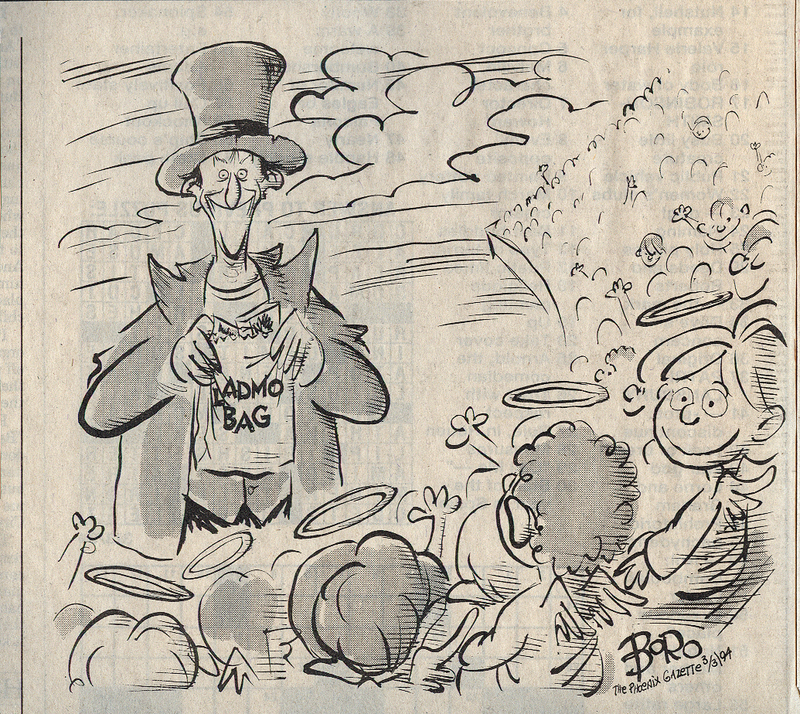 Famous for his top hat pushed down over his ears, T-shirt with a painted-on tie and goody-filled Ladmo Bags, he reached the children like no other person could. Over 1,000 people attended Ladmo’s funeral, many of whom had never personally met him. The outpouring of people who went to pay their last respects is testimony of the tremendous impact he had on the people of Arizona. Ladimir Kwiatkowski, husband, father of five and grandfather of seven, will be missed not only by his family but by the three generations of Arizonans to whom he dedicated his life to making happy. After Lad’s death, the Boyce-Thompson Arboretum up in Superior [ Arizona ] dedicated a tree to Lad. Appropriately it was a pistachio tree. Lad would have loved having a nut tree be planted in his honor. I put a shovel full in. There were about 150 people showed up for this tree dedication. Somebody in the audience walked up, took the shovel from me, put in some dirt, and started to talk about Ladmo. One by one about half of the people in that crowd came up [and] had something nice to say about Ladmo and filled in all the area around the tree. They were an extremely important part of the dedication, the ceremony. Shortly after Ladmo’s death, a valley chapter of the Boys and Girls Club renamed one of their Tempe branches after Ladmo. Patsy Kwiatkowski and Pat McMahon were on hand to unveil a large photograph of Ladmo at the dedication ceremonies on June 16, 1994. Former director Sharon Kelley treated fans to six half-hour episodes culled from videotape in the Channel 5 archives. 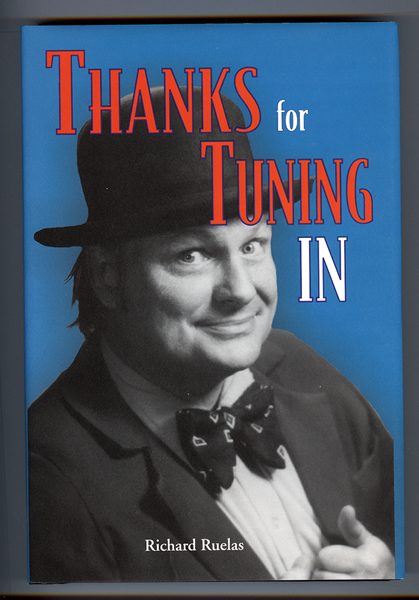 Hosted by Pat McMahon, the shows ran from June to July 1994. In 1994, local publisher Jeanne Kuhman (owner of View Designs) commissioned authors Richard Ruelas and Michael K. Sweeney to write a history of the show. The result was the delightful HoHo!HaHa!HeeHee!HaHa! 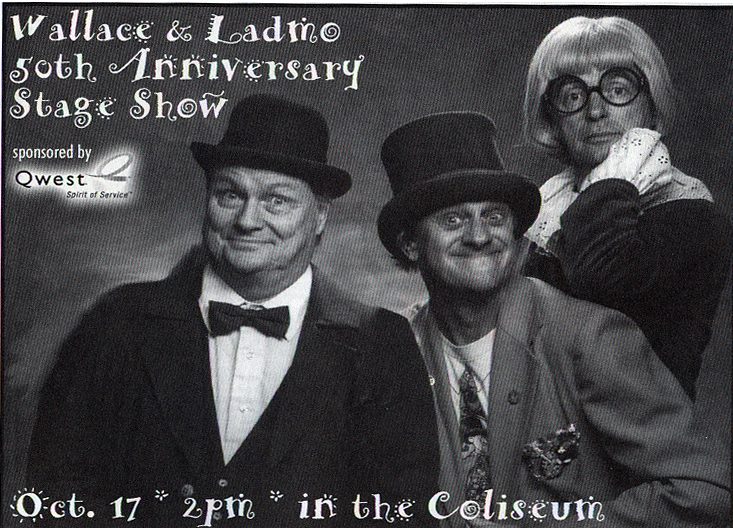 The Wallace and Ladmo Show, 35 Years of Laughter. 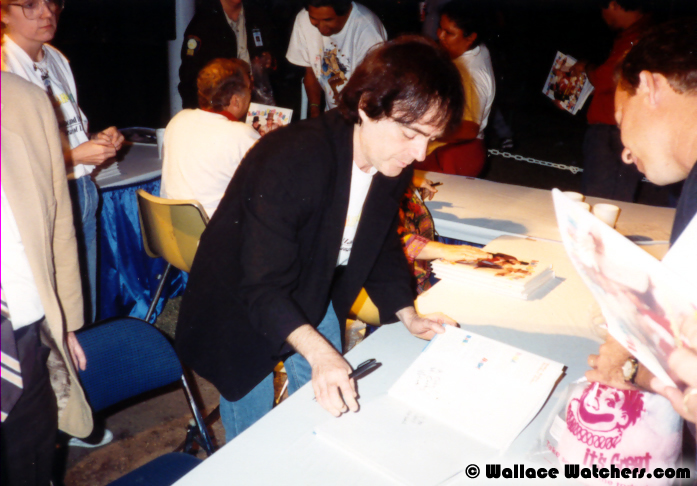 The book debuted at the dedication of the Wallace and Ladmo Stage at the Arizona State Fairgrounds (see below). The book eventually sold out. All of the proceeds from the sale of the book were donated to the Phoenix Children’s Hospital. The hospital was able to purchase a new heart monitor with the money from the book. 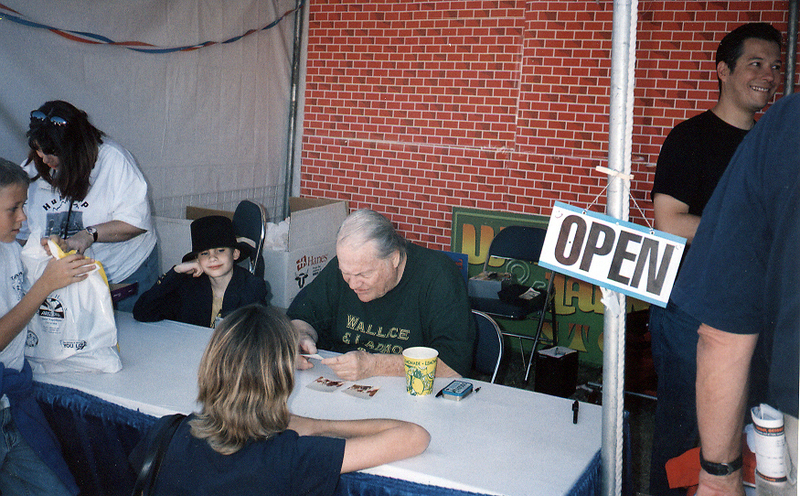 On Thursday, October 20th, 1994, the Lagoon Stage at the Arizona State Fairgrounds was renamed the Wallace & Ladmo Stage. Among the dignitaries who spoke at the dedication were then Arizona Governor Fife Symington and Arizona State Attorney General Grant Woods, a long-time fan. Wallace, Pat McMahon and Patsy Kwiatkowski each spoke to a large crowd that gathered to honor the trio that have hundreds of performances on that very stage. I have the very distinct honor of being able to speak, I guess, for all the kids over the last several decades who grew up here in Arizona watching these guys on television and on stage. That’s my task here today, is to somehow speak for all of you and for all these kids and that’s one of the toughest things I’ve had to do here in the last four years. But I’ll try to do it as well as I can. At our house in Mesa, if it was 4 o’clock, you knew where the kids were and you knew what was on television. We were in front of the television watching the Wallace and Ladmo Show. We tuned in for the cartoons because they were the only place showing cartoons but we also tuned in to see all of these guys. To see Wallace and to see Ladmo and to see all of Pat’s crazy characters. And every day we learned a little bit about justice and injustice. It was played out in very real terms because Gerald everyday would almost get away with some terrible things but by the end of the show, justice would prevail and Wallace would somehow figure out, with our help, that it really was Gerald who did the bad things and not Ladmo. I was one of the thousands of kids who followed these guys around to Legend City or Encanto Park. Every year, right here on this stage, we screamed and we pleaded for justice and we cheered for Ladmo. Before any one of us had discovered rock and roll, we had already experienced group hysteria right out here as we watched this show. I never got a Ladmo Bag before, and I can tell you I’m still kind of steamed about that. I never got to pick a prize off the shelf, even though there was a Crash-Mobile there that I always wanted and still want today. Then and today I blame the station or some of the big-shots there. I never blamed Ladmo because I know he would have picked me. 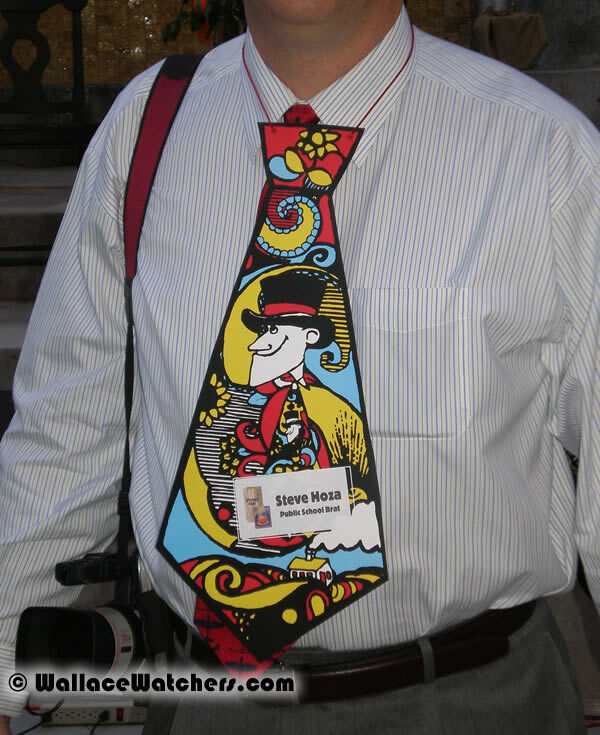 I had an experience later when I was senior class president at Mesa Westwood [high school]. I brought these guys out to the school. We dug up an old Boris Karloff movie from the archives of Channel 5 and we showed it to all these kids for a fund raiser. There was about 800 elementary school kids out there waiting to see these guys and Ladmo came up to me and he said “Here, let me show you something.” He grabbed Wallace’s derby and he stuck his hand out the curtain. Nobody said anything and that got their attention. He waved it around. Then he grabbed his own hat and he just stuck his hat out there in front of the curtain and the whole place went absolutely crazy. They were screaming, yelling, working themselves into a frenzy. Then he said “Watch this.” He went over to Pat and he got Gerald’s glasses and put Gerald’s glasses out there. All these kids started yelling, screaming. Some of them stormed the stage. They had to be pushed back from the stage. They were so upset at just seeing the glasses. And remember, this was in Mesa, so you can imagine what it was like here at the fair. A couple of years ago, I guess a few years ago, I sat out there with my own children and I brought my little boy and little girl out here to watch a stage show, to watch Gerald and Ladmo in action. That was quite a thing for me and a very important moment in my life to see my own little kids standing there yelling as loud as they could, pointing up at the stage at Gerald . . . I saw then maybe what all of you had seen, the generation to generation and decade to decade; all children in Arizona responded the same. I think I took it harder than I would have expected when I heard that Ladmo had died. I thought a part of me and a part of my childhood had slipped away when the announcer said those words. Because with Ladmo we were always laughing. We were always smiling. He got older and we got older, but we were all still kids as long as Ladmo was around. I started feeling sorry really not for myself but for today’s children. They’ll have to sort through a whole world of cynicism to find true goodness out there in today’s world. But back then all we had to do was come to the [ Arizona ] State Fair or tune in television to Channel 5 at 4 o’clock . Now all we have to do is close our eyes and remember the joy and the caring and the love these guys brought to us every day that helped make our childhood a happy time. So I guess for all the kids young and older now, I am here to thank Ladmo as he takes a break from playing with the children up there in heaven. 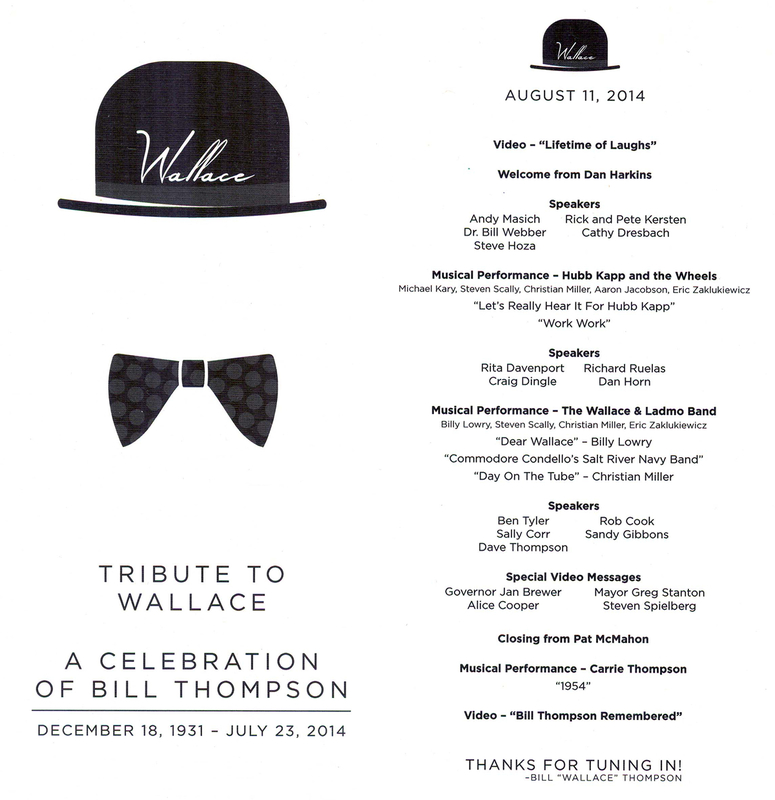 To thank Wallace. To thank Pat. To thank you for the great memories, sure, but also to thank you for being such an important part of a very important thing. Happy childhood. A happy childhood that for all us led to a happy life. Thank you. 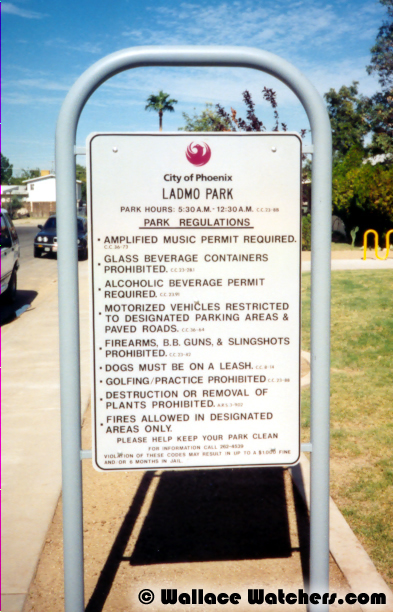 Shortly after Ladmo’s death, a group of dedicated folks on the west side of Phoenix gathered together and transformed an empty half-acre of land near 41 st Avenue and Earll Drive into the Ladmo Park. The movement to build the park came from the West-side Block Watchers who convinced City Councilman Salomon Leija and others to purchase the property. After the site was secured, Mike Markham of Markham Construction and the American Subcontractors Association of Arizona built a basketball court, picnic table, barbeque, and drinking fountain all in one day. 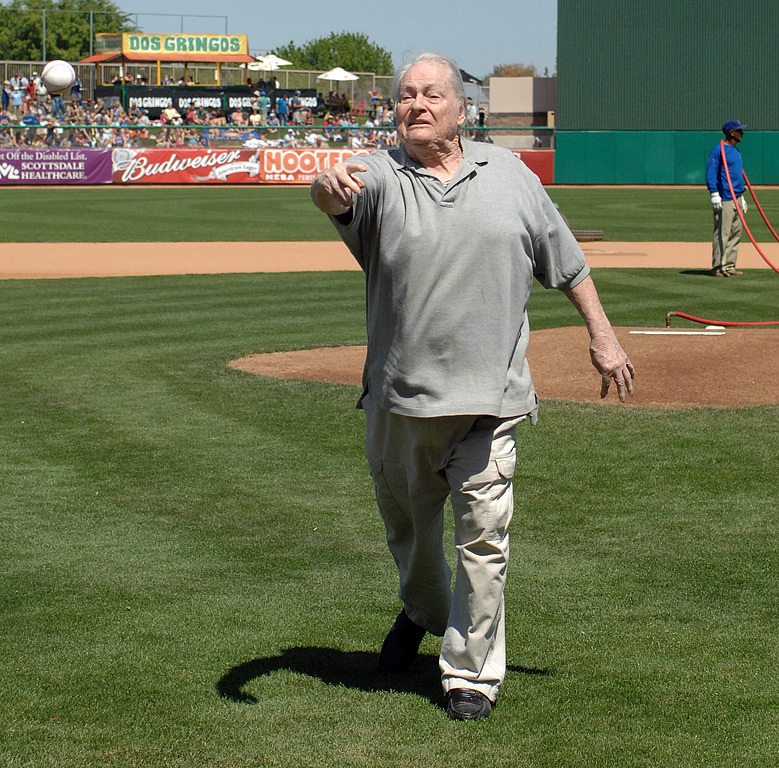 For years Ladmo spent time in parks doing shows, playing softball, coaching baseball. And in doing so he saw how parks have been a place kids can go to play, meet their friends and have family barbeques. He loved to hear kids laugh and see their happy, smiling faces. To all the people who donated the materials and time, you did an amazing job. It is very obvious that there was a lot of love, caring and thoughtfulness put into this project. And now with each beautiful Arizona sunrise, this park will be eagerly awaiting the sounds of children at play. Having this park dedicated in Ladmo’s memory gives the family the knowledge that his passion for children’s laughter will now pass from generation to generation. We thank you all for keeping Ladmo’s memory alive. And last, but not least, speaking as Mrs. Ladmo, mom and grandmother, I expect you children to keep this park cleaner than your rooms. Thank you very much. 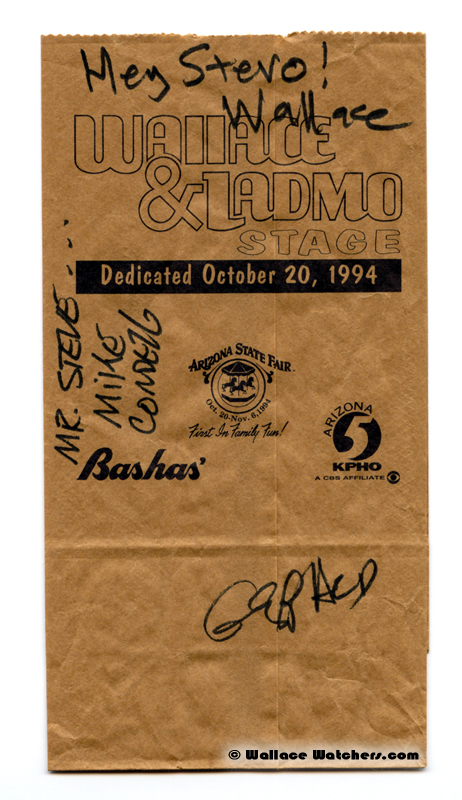 After many months of work, Mike Condello issued a CD in December 1994 of the music from the show. Along with Hub Kapp and the Ladmo Trio, the LaChords and Commodore Condello’s Salt River Navy Band’s local hits were compiled and remastered by Epiphany Records in Tempe, Arizona. Local music historian John Dixon and Brad Singer were the executive producers. All the profits from the CD went to the Boys and Girls Club of the East Valley, Ladmo Branch. Local photographer and fan David Cook opened an exhibition of photographs he took of the Wallace & Ladmo 30th Anniversary Show at the Eleven East Ashland Independent Art Space in Phoenix. The show ran from March to April 1995. Besides David’s photographs, there were artifacts and other goodies on exhibit that were graciously loaned by, among others, Wallace, Patsy Kwiatkowski, Chris Kozakis of the Wallace & Ladmo Fan Club, Sharon Kelley and Rick and Pete Kersten. Just over a year after the death of Ladmo, Wallace and Ladmo fans were saddened to learn of the death of the man behind the music of the show, Mike Condello. Mike had battled chronic depression for many years. He ended his life on August 17th, 1995 in his Santa Monica apartment. Last week I was driving down the road, teary-eyed, and I was, quite frankly, feeling a lot of grief. And I came upon a truck. It was a large van. And there was writing on the back of it. The first words on it was the name of the company. For the life of me, can’t remember what it was. But under it was the motto of that company. And the motto was “Music Is Happiness”. And I tell ya’, the grief seemed to lift. I felt so much better because I finally grasped, I think, what Mike Condello, my best friend, brought to all of us and the legacy that he left. Wall[ace] said he can’t believe he’s gone. And Wall, I tell ya’, I don’t feel he has gone. I look at it that he’s on a journey and in his absence, Michael has left us with his music, with his laughter and with his wit. And I am very proud to have the time that I did with Mike. The association that we had, both professionally and personal. I love him dearly, as we all do. He’ll be missed, but believe me, you’re right, not forgotten. He’s on a journey and we have his memories to carry us through. Thank you all very much. Local playwright Ben Tyler penned two plays based on the show. 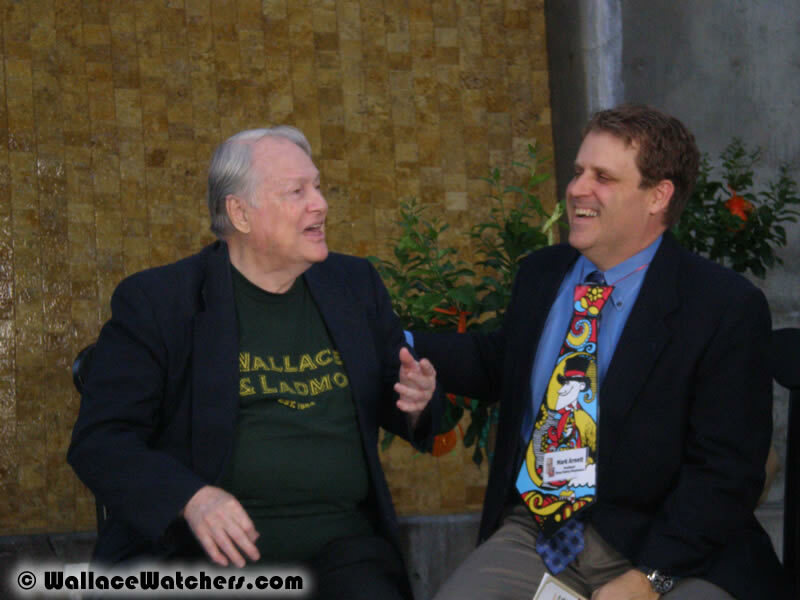 His first, The Wallace and Ladmo Show told the story of the rise of Hub Kapp and Pat McMahon’s decision to stay with the show rather than accept a Hollywood recording contract. 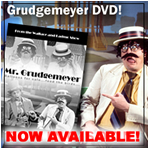 This first play ran throughout most of 2000 at both the Desert Foothills Theater and the Herberger Theater in Phoenix. 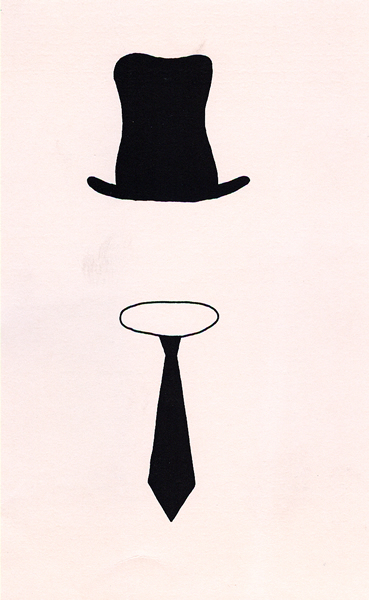 The second play, The Last Wallace and Ladmo Show, dealt with the final show and the death of Ladmo. The play ran from August to September 2002 at Theater Works in Peoria, Arizona. View Designs followed up their success with the first Wallace & Ladmo book with a compilation of Aunt Maud’s “children’s stories”. The book was put together by Wallace and Pat McMahon, and delightfully illustrated by the Kersten Brothers. Alice Cooper wrote the introduction. OK, I didn’t know how to pronounce it at first, either. Dennita Sewell, the Curator of Fashion at the Phoenix Art Museum, opened a splendid exhibit on Trompe L’oeil (pronounced TRUMP LOY), the art of printing accessories on clothing to give a 3-D effect. 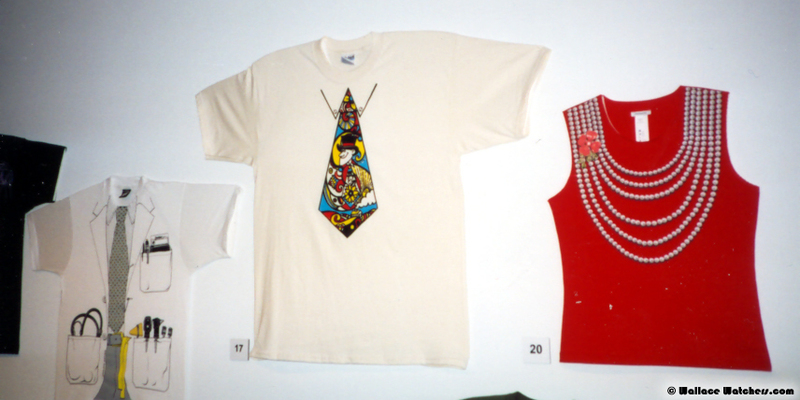 Prominent in the display was a Ladmo tie t-shirt that is perhaps the first ever Wallace and Ladmo artifact ever put on exhibit at the Phoenix Art Museum. The show ran from March to June, 2003. 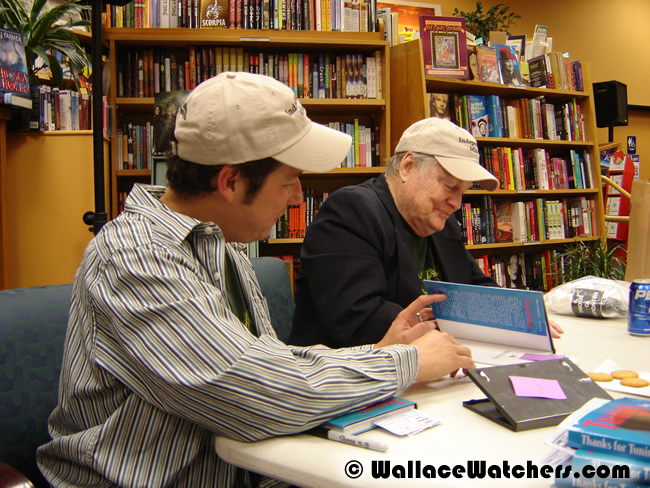 After minutes of intensive work, Arizona Republic columnist Richard Ruelas and Wallace got together to write Wallace’s autobiography. 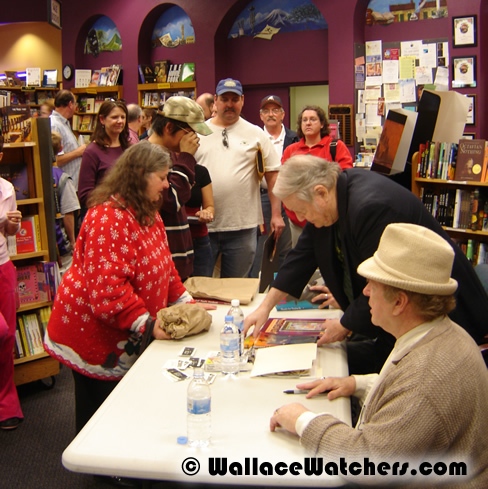 Published in 2004, Thanks for Tuning In is 198 pages of text and photographs of Wallace’s boyhood, move to Phoenix and creator of the show. The book has already had several printings. 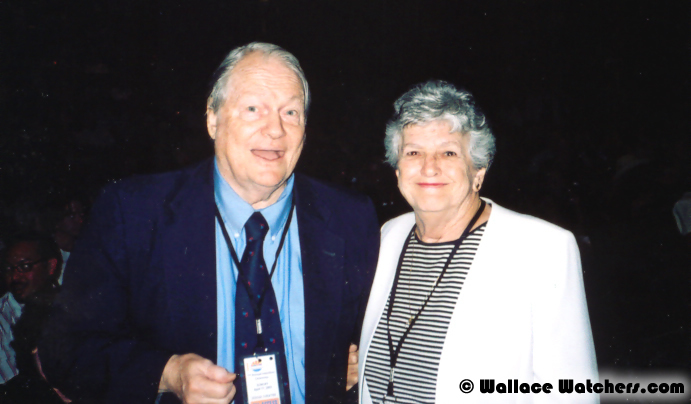 In honor of the 50th Anniversary of the start of It’s Wallace on KPHO-TV5, the Arizona State Fair held an anniversary stage show at the Veteran’s Memorial Coliseum on Sunday, October 17th, 2004. 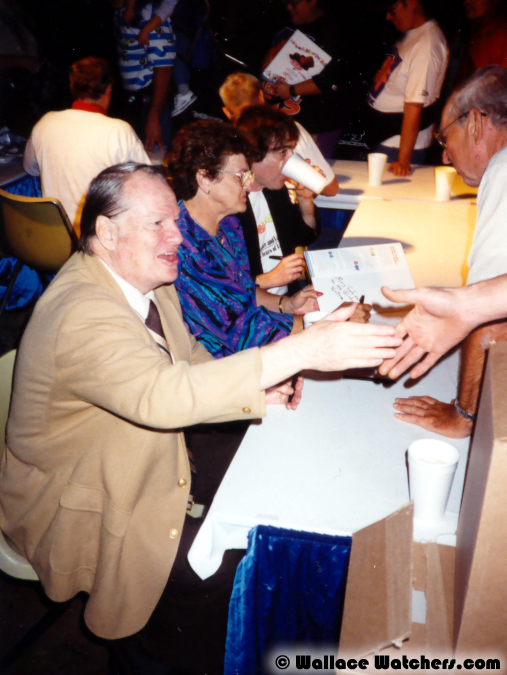 Wallace and Pat McMahon was on hand to meet the fans and sign autographs before the show. The first 500 fans on hand received special 50th Anniversary Ladmo Bags. Several thousand fans inside the Coliseum were treated to Aunt Maud being driven on stage by Harry Florian. Wallace and Gerald continued their spat. A large screen above the stage paid tributes to Ladmo and Mike Condello. The Fiesta Bowl Committee honored Wallace and Ladmo by creating a float that was featured in the annual Fort McDowell Fiesta Bowl Parade on December 31, 2004. Wallace and Pat McMahon (and a large photo of Ladmo) rode on the float accompanied by fans dressed up as characters from the show. The Arizona Music & Entertainment Hall of Fame was created in order to recognize, honor and educate the public regarding the Arizona musicians, entertainers, artists and others whose contributions have had an impact on the arts locally and nationally. 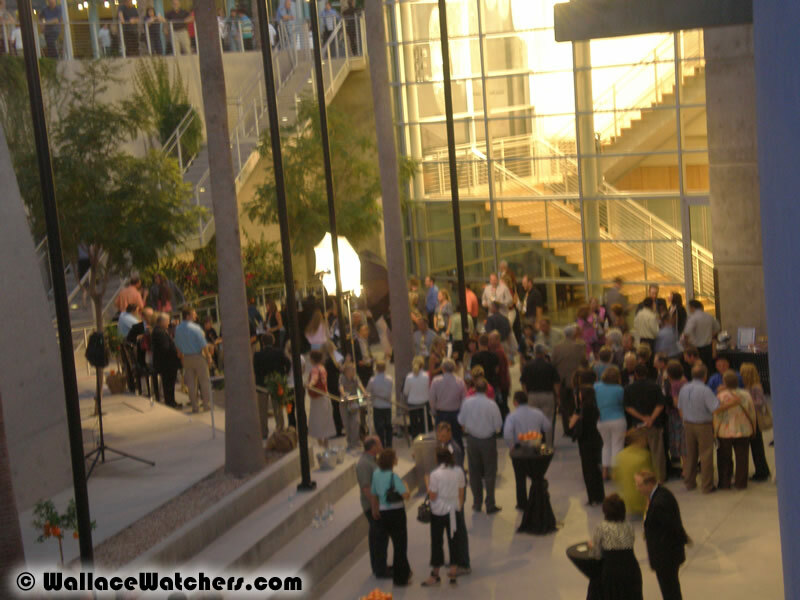 The first public Induction Ceremony was held at the Dodge Theatre in Phoenix on April 17, 2005. Wallace and Ladmo, Pat McMahon and Mike Condello were honored at this fun-filled event. Patsy Kwiatkowski (known as “Mrs. Ladmo”) accepted for Ladmo, and Samantha Condello accepted for her father. More than one Ladmo tie t-shirt was spotted in the audience. 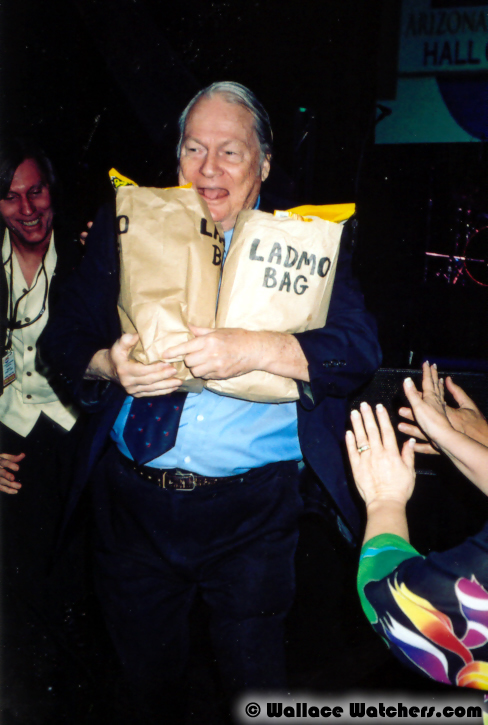 Naturally, Wallace gave away a few Ladmo Bags. at the HOF induction (2005). 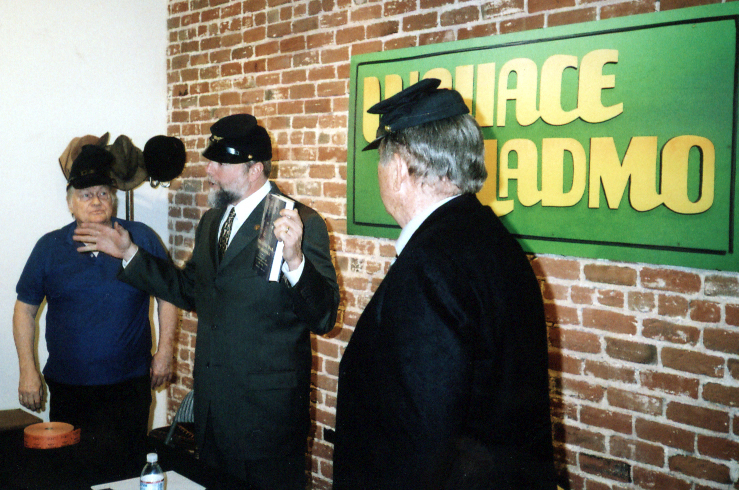 The owners of the IO (pronounced EYE-Oh) Restaurant unveiled a painting of Wallace, Ladmo and Gerald in their “Comedians Hall of Fame” inside the restaurant at the Biltmore Fashion Square on January 13, 2006. Wallace and Pat were there to uncover the painting and give out Ladmo Bags. Yes, you read that correctly. Andy Masich, former director of the Arizona Historical Society, Central Arizona Division, recently completed a book on the history of the Civil War in Arizona. Wallace and Ladmo alumni Sandy Gibbons (Inspector Blitz, Ranger Bob) hosted the event with Wallace. Andy, a frequent visitor to the show (“Andy from the Museum”), spoke about the book and had a book signing. Local musician Joe Bethancourt (another frequent visitor to the Wallace and Ladmo Show) played Civil War era songs on his banjo. Wallace’s grandson Billy sang a rendition of Mike Condello’s song 1954 that he wrote for the Wallace & Ladmo 35th Anniversary Show. 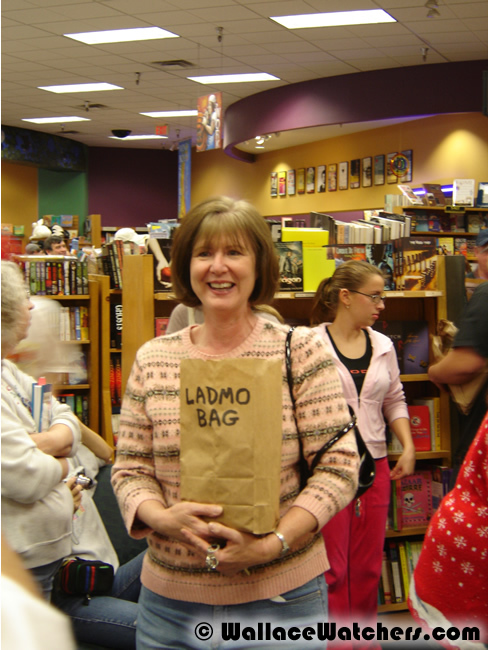 Of course, Ladmo Bags were also given away. 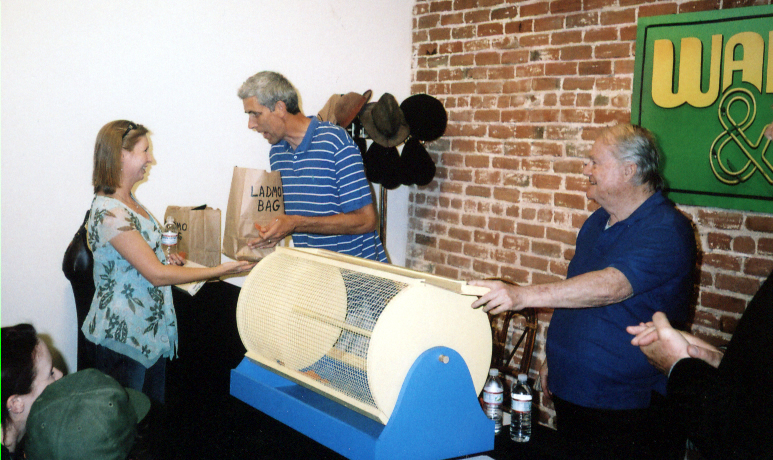 Wallace’s friend, former Phoenix Sun’s great Alvin Adams, had the honor of drawing the tickets from the barrel and awarding the bags. A fun time was had by all!! 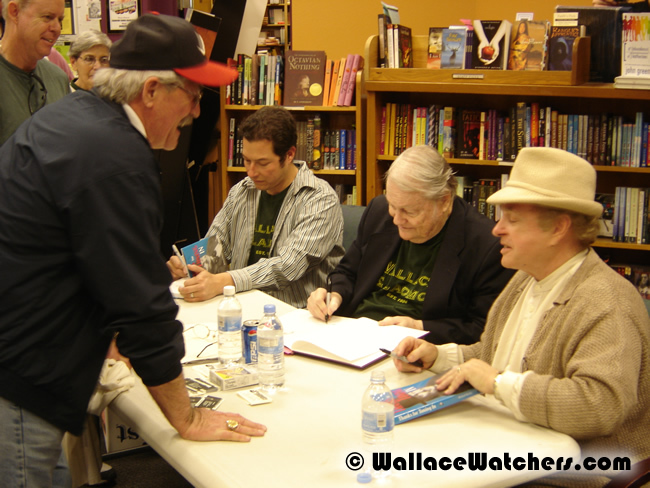 To honor the show, Mayor Phil Gordon declared that Saturday, April 3rd, 2004 will always be known as Wallace, Ladmo and Pat Day in the City of Phoenix. The full declaration can be found at the City of Phoenix. 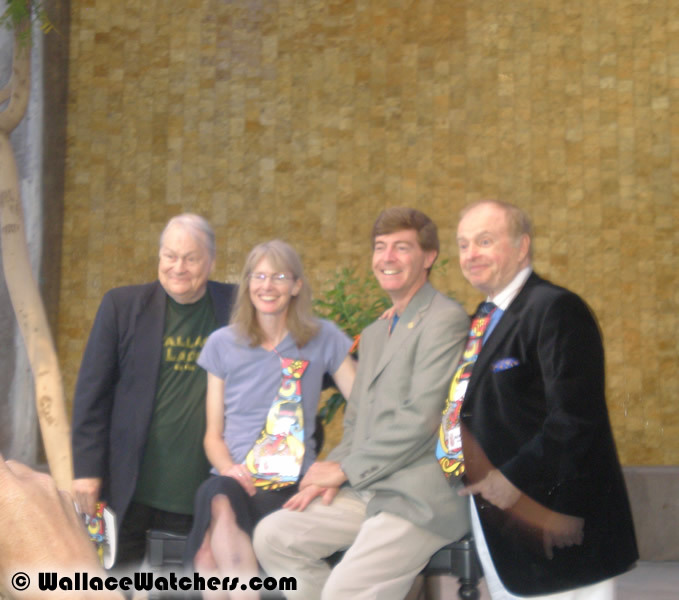 In August of 2006, WallaceWatchers.com became the Official Website for the Wallace and Ladmo Show. Steve Hoza, a local historian and long time fan of the show, was approached to write a book on the show. The book was going to be a history of the show, from the perspectives of the fans. Mass interviews were conducted and the book almost made it to press. Deciding that the fans needed to see this work, Wallace and Hoza came up with the idea of launching it on the world wide web. A local web designer, who just happened to be a fan of the show and Steve's nephew, Tom Dickson signed on to create the site. To this day Steve develops the content and Tom does all the graphic and web work that makes WallaceWatchers.com the best site on Wallace and Ladmo. 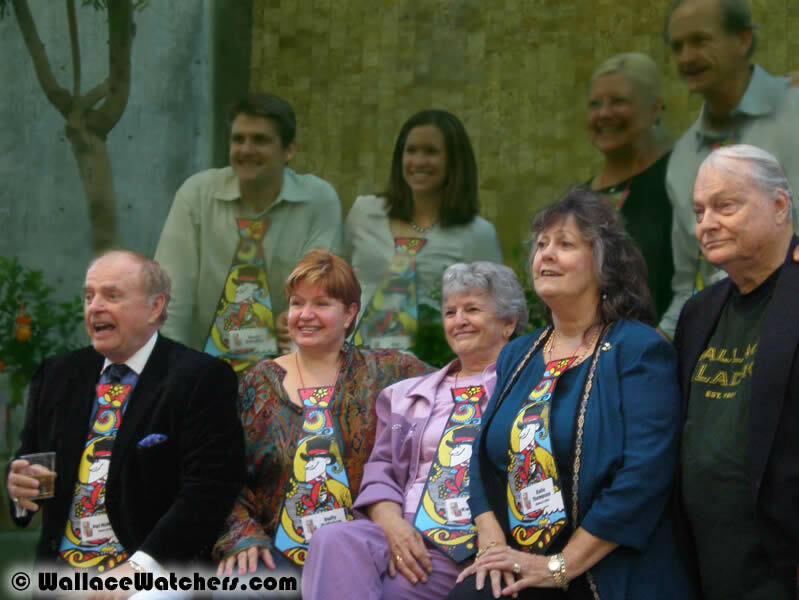 Since the start of the site we have added Ladmo Tie T-shirts and Old Time Movies DVD's to purchase, dozens of computer desktops to download, audio clips of the gang, videos from the show and video interviews with the cast. 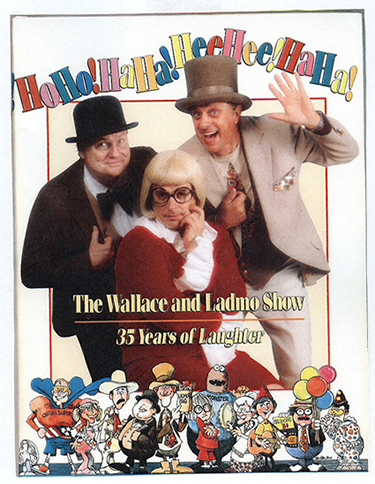 On Saturday, April 12, 2008 the Citrus Valley Playhouse presented an All-Star Tribute to the Wallace and Ladmo Show. The on-stage radio production show was hosted at the Mesa Arts Theatre. 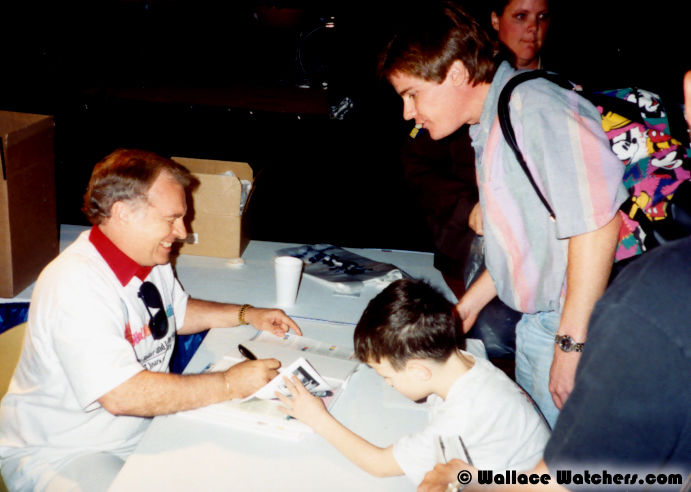 Prior to the show there was a VIP reception where children and adults alike could take photos with Wallace and Pat. In attendance were: Grant Woods (Attorney General), JR (KDKB), Al McCoy (Phoenix Suns), Joe Arpaio (Sheriff), Tara Hitchcock (Ch. 3 News), Marshall Trimble, Phil Gordon (Phoenix Mayor), Hugh Hallman (Tempe Mayor), Dan Harkins (Harkins Theatres), Blaise Lantana (KJZZ), and Harry Mitchell (Senator). . In addition to the show a short awards ceremony was held afterward where Dan Harkins and the Citrus Valley crew presented Wallace, Pat and Patsy Kwiatkowski (Ladmo's Widow) with the first Citrus Valley Playhouse Lifetime Achievement Awards. Following the awards a record 50 Ladmo Bags were given out in less than 50 seconds. 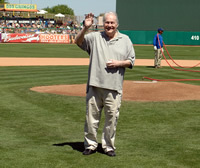 The following comes from a fan who witnessed Wallace throw out the first pitch at a Cubs Spring Training Game in Mesa (2011). My name is Scott Nelson and I work for the Chicago Cubs organization. 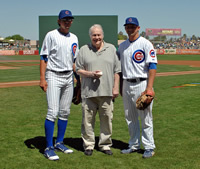 This spring we had a special treat when Bill Thompson came out to our game on Sunday, March 27 to throw out the first pitch. It was a great day and it was really fun for the fans having a chance to see Wallace. I thought you might like these photos for your web site. It was a memorable day at Ho Ho Kam Park in Mesa! 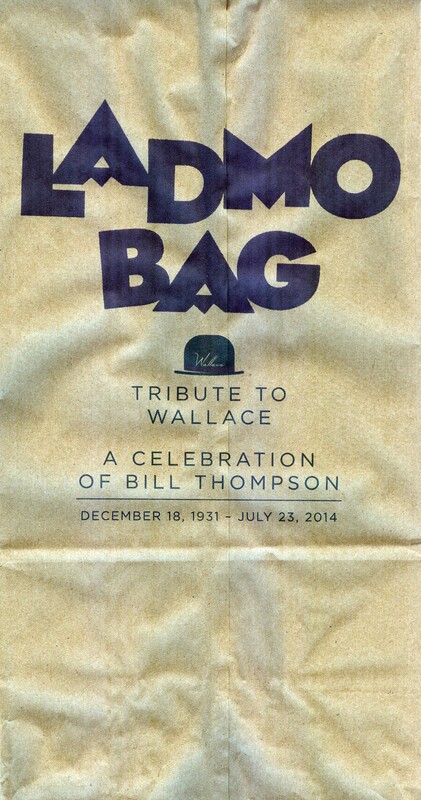 Bill 'Wallace' Thompson passed away on July 23, 2014. A few weeks later a public memorial was held at the Cine Capri Theatre at Tempe Marketplace. Over 600 people were in attendance and were treated to a Ladmo Bag and a host of speakers who reflected upon Wallace's legacy. The photographs on the screen during the memorial were all provided by WallaceWatchers.com.